Here's the next one. I don't like it at all. I knew I wouldn't even before I tatted it because I could tell from the drawing that it would leave too much space between motifs. The only way to join this one is at the corners, which will leave a large empty diamond shape between motifs. For that reason I'm discarding this one as a potential candidate. Besides, it's only 3.5 inches across which isn't big enough for what I want. I did put a picture together of 4 of them as you can see here. Notice the large gap between the motifs? I think it would need a small fill in motif to make it use able for my purpose. The idea of having to tat more pieces and have more ends to hide isn't something I want in a project that is already likely to be large enough I knew there was something wrong with it because even though it's unblocked it should have looked more square than this. Then I noticed that I joined one of the cloverleafs to the top instead of the side of the ring adjacent. That's what has it looking rather skewed where the left and right sides meet. The gap should look like the one between the top and bottom pair. This design does have one thing in it's favour. You can make a diagonal motif and still be able to tat it. I started the design along one side, but I could have started it at the point. If the pattern were cut in half you could either leave the small inner rings off or use them as connection points for an outer edging or for some other part of a garment. If I were making a triangular shawl, I'd probably create and edging that would join to those unattached rings. A lot of the time when a triangular piece is needed, it's because it has to fit at armholes or necklines of a vest or jacket so those extra rings would come in handy for fitting to the required shape. I have another drawing I need to tat up to see how it will look, then it's back to the drawing board to work on some other designs. By the way, all of these square designs, they weren't originally square. I have some interesting ideas I'm playing around with. Stay tuned for more fun stuff. VERY very pretty, Sharon! You have amazing talent. It's gorgeous, as well! Happy New Year! Happy New Year, Sharon! I'm enjoying reading about your square motif adventure! I love your ability to stick with an idea until you are able to achieve your goal! I'm looking forward to seeing which square suits your purpose! It's far too long since I've been in touch! I'm at a loss for words for my appreciation of your starting this 25-Motif challenge. 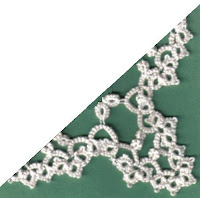 Also, it's so educational to read your tutorials and discussions of tatting. Never did I dream in 1989that I would be sitting at a computer in 2009 communicating 'instantly' with tatters all over the world! 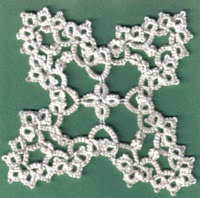 I am constantly in awe of everything that's happened in tatting since the internet, and I am 'huffing and puffing' trying to keep up with it all. I sure wish I were younger - when I had much more energy and could burn the candle at both ends! Thanks so much again, Sharon, for all you do! Wishing you and your husband all the best in the New Year! I think the "empty space" (when you put four of those together) is a great shape! It adds another design element, without the work. Looks great! 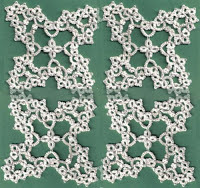 I just picked up "Tatting together square motifs" by Iris Niebach. I can't wait to get started. I am wondering how many different squares I can combine? You can attach as many squares of the same pattern together as you want. If the squares are different patterns you may not be able to join any of them together as the connecting points may not match up.